Asbestos was used in some building & household appliances as gasket material, insulating material, or fire-proofing mateiral. Asbestos might be found in some household appliances such as clothes dryers, hair dryers, irons, toasters, and even refrigerators, though usually that asbestos is well covered and harmless. This article series provides a master list of the forms in which asbestos was used, a list of known asbestos-containing materials, and links to detailed articles about individual asbestos-containing products & materials found in buildings and in a wide range of products used in both home and industry. Here we list household appliances that might contain asbestos and we describe the forms in which asbestos might appear in appliances. Asbestos was widely used in many gas & electrical appliances as a heat shield, as a gasket, as insulation, and sometimes as a structural component. Watch out: Don't panic about possible asbestos in a toaster, iron, or refrigerator. In most instances even when asbestos was used in a friable form it was enclosed within appliance walls or components. The asbestos hazard from its presence in home appliances is likely to be below the limits of detection unless you disassemble and chop, grind, or saw these materials. Asbestos may also appear in building or home appliances as a secondary product such as asbestos used in electrical wire insulation in toasters or irons, or in a high-temperature-resistant light bulb. Asbestos was used in these home appliances and possibly others that we will describe on this page: jbroilers, coffee pots, clothes dryers, coffee pots, in cookstoves (Moffatt and others), coolers, cooktops, deep fryers, dishwashers (possibly), ranges, refrigerators, irons & iron rests, toasters, electric heaters, ovens, popcorn poppers, vacuum cleaners, and washing machines. Other household items used in the kitchen such as pot holders and some ironing board covers used asbestos fabrics. Asbestos was used in electrical wire insulation and insulation in some electric coffee pots. Research DOES confirm that asbestos was used in some older clothes dryers from the 1940's and 1950's and possibly extending in North America at least into the late 1970's . 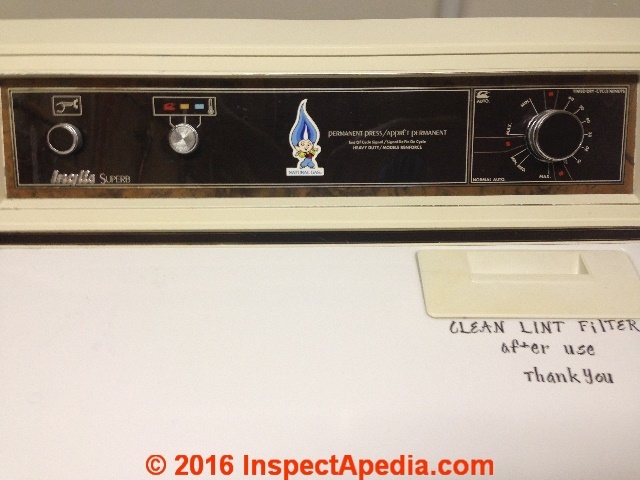 See ASBESTOS in CLOTHES DRYERS where we discuss asbestos use in clothes dryers and washing machines, including gaskets and clothes dryer belts and in clothes dryer electrical components. In the U.S., following a U.S. CPSC study finding dangerous amounts of asbestos release from hair dryers from eleven hair dryer manufacturers, those companies issued a voluntary refund and return policy and they stopped manufacturing asbestos-containing hair dryers. Asbestos is not likely to be found in a hair dryer manufactured after 1980. Asbestos was widely used to carry electric heating elements, in heat-resistant wiring, and possibly in other components in electric heaters manufactured (in the U.S.) up to 1974. Asbestos was used as early as 1900 in irons that were heated on stovetops where asbestos formed part of heat-resistant handles on those irons. Asbestos was used in iron rests such as Craftmade™ iron rests (Norton Accessories Manufacturers, NY) until 1960. Asbestos was also used in home and commercial pressing pads and in larger ironing machines and manglers. Asbestos was used in hair curling irons. (Droogenb1965). We found patents citing use of asbestos in steam irons and clothing irons as late as 1980. (McMullen 1980). Droogenb, Jean Francois Dit Rog, and Antoon Joseph Johan Iren Camil. "Implement for setting hair." U.S. Patent 3,220,421, issued November 30, 1965. In the example illustrated, the element 4 is constituted by a spring having joining convolutions and inside which is housed a cylindrical asbestos wick ...The sheath 2 is provided with one or more rows of ports or perforations 16 located at suitable points so as to allow the outlet of the vapors produced by the liquid contained in the sheath and imbibing the asbestos. Joseph, D. Alessandro. "Flat-iron provided with a steam ejection device." U.S. Patent 3,184,871, issued May 25, 1965. Melvin, Gershon. "Press pad." U.S. Patent 2,482,412, issued September 20, 1949. McMullen, Alan R. "Steam iron with low temperature soleplate." U.S. Patent 4,233,763, issued November 18, 1980. Oivind, Meidell Birger. "Steam developing device for flatirons." 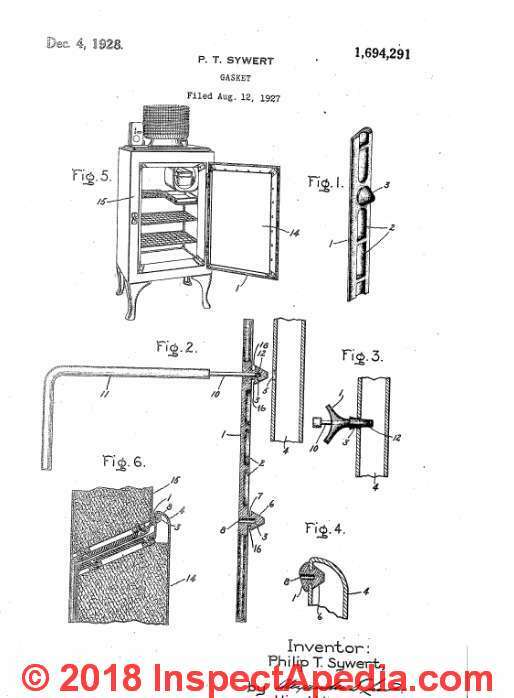 U.S. Patent 1,963,858, issued June 19, 1934. Asbestos in ironing boards, various manufacturers, using asbestos based cloth, possibly also asbestos based heat insulating padding. Reply: Asbestos was not found mentioned in patent research for the 1927 GE Monitor Top refrigerator - illustrated above on this page. Possibly, but my research did not find any mention of asbestos in the description of the GE monitor-top refrigerators. 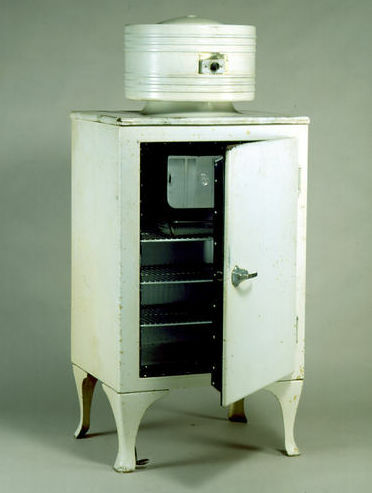 The GE Monitor Top refrigerator was a major product development for General Electric and was widely sold and is still recognized world-wide. I searched particularly for refrigerator insulation and for refrigerator gaskets and gasket patents associated with GE from 1925 - 1930 to see if those mentioned use of asbestos and did not find that indicator. Griffiths, Richard T. "Packing gasket and method of making same." U.S. Patent 1,705,455, issued March 12, 1929. Asbestos could also have been used as a refrigerator body or door insulating material, though I did not find that either (yet - I'm still researching). Other patents from the same era such as Carrey (1930) do cite use of asbestos in the refrigerator construction. Carrey, John O. "Vacuous refrigerator and method of maintaining vacuum therein." U.S. Patent 1,747,969, issued February 18, 1930. Original Assignee C & C Engineering Company Inc.
A U-shaped strip 24 of heat non-conducting material such as asbestos is placed over the bent edge 20 and a thin sheet 25 of lead is then placed over the U-shaped strip 24 and the whole is then forced into the pocket 23, and the assembled joint has the lead covering 25 bearing against the inner face of rebent edge 21 and the edge from edge 21 by asbestos covering 24. Ballew, Neual W. "Vacuum-insulated container." U.S. Patent 1,561,769, issued November 17, 1925. The inner shells each contact with the outer shell only over a small surface at its front end. The doors 4:, where they contact with the outer shell may be lined with a suitable heat insulating material, such as cork or asbestos, not shown. Asbestos was widely used in toasters in several forms including electrical wire insulation, toaster side insulation, and heating element carriers from about 1910 through the 1970's and in some toaster appliances even into the mid 1980's. Asbestos was also used in toaster covers (Landry 1981). Butler (1903) patented a hand-held bread toaster (not-electric) that used or might use asbestos as one of the early U.S. patents citing use of asbestos in toasters. Asbestos was still being used in toaster appliances in 1982 (Zim 1982) and is described in baking and frying appliances in 1984 (Matz 1984). Anderson, Roy J. "Electric toaster." U.S. Patent 2,548,511, issued April 10, 1951. Barton, Ruth. "Household technology in Western Australia 1900-1950." Oral History Association of Australia Journal, The 7 (1985): 108. Butler, Louis F. "Bread-toaster." U.S. Patent 743,688, issued November 10, 1903. This invention relates to the class of breadtoasters in which a wire-netting or analogous open-work metallic sheet is superposed upon a heat-transmitting plate of asbestos or other suitable fireproof material. Cites use of asbestos in the supporting board for heating elements in the toaster. Clark, Newman S. "Toaster." 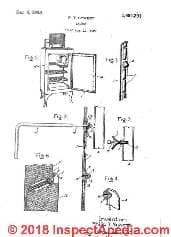 U.S. Patent 888,960, issued May 26, 1908. In the preparation of my device, I make a mixture composed of about 50 parts of fire-clay, 25 parts of clean sharp sand, 10 parts of asbestos, and 15 parts of wheat bran. This mixture properly moistened and adherent may be formed in molds into disks or plates of any suitable description. ... waste asbestos board may be employed, and these parts shall be hereinafter referred to as asbestos boards or sheets, although not limited to i this material. The end wires and intermediate wires are used to receive, for instance, bread and the like vto be toasted, the edible being supportedqby said wires free of the heating element. The heating element, which 1s designated 12, is supported by hook-like parts 13 of staples 14. The staples 13 pierce the uppermost asbestos sheet or plate, are extended horizontally thereunder, as at 14', are passed up through said upper sheet of asbestos, and are clamped over the top surface of said upper asbestos sheet. Hall, T., "Bread or Other Toaster", U.S. Patent 689,182, issued December 17, 1901 - cites use of asbestos in the parts of this non-electric toaster. Landry, Jean-Guy. "Cover for use on a toaster." U.S. Patent 4,254,695, issued March 10, 1981. The cover is preferably made of two layers of metal 26 and 28 and a layer of heat-insulating material 30, such as asbestos, is sandwiched between the two layers 26 and 28 at the top of its embossed portion. Lemaster, Charles A. "Toaster." 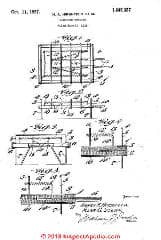 U.S. Patent 1,661,294, issued March 6, 1928. - Cites use of asbestos in the supporting board for heating elements in the toaster. Matz, Samuel A. "Equipment for Frying, Baking, and Drying." In Snack Food Technology, pp. 231-250. Springer, Dordrecht, 1984. Sheet material composed essentially of asbestos fibers and binders can be used as both insulation and a structural component. In this case, an outer covering is not necessary … FIG. 18.2. Toaster oven. Snyder, Paul V. "Electric toaster heating unit." U.S. Patent 3,283,128, issued November 1, 1966. In perhaps its simplest form, the heating unit of the invention includes a relatively stiff resistance heating wire formed into a sinous series of loops which are secured at -their ends to an elongated support strip of insulation material such as asbestos. Zirn, Rudolf F., and Erich Karlsen. "Insulating container for cooking food." U.S. Patent 4,323,167, issued April 6, 1982. Excerpt: This disc 9 may be made of asbestos, rubber, glass fiber reinforced plastic or like heat-resistant and inexpensive material. Hwang, Sung Ho, and Wha Me Park. "Evaluation of asbestos-containing products and released fibers in home appliances." [PDF] Journal of the Air & Waste Management Association 66, no. 9 (2016): 922-929. Abstract: The purpose of this study was to detect asbestos-containing products and released asbestos fibers from home appliances. The authors investigated a total of 414 appliances manufactured between 1986 and 2007. Appliances were divided into three categories: large-sized electric appliances, small-sized electric appliances, and household items. Analysis for asbestos-containing material (ACM) was performed using polarized light microscopy (PLM) and stereoscopic microscopy. Air sampling was performed to measure airborne concentration of asbestos using a phase-contrast microscope (PCM). The results of the analysis for ACM in appliances show that large-sized electric appliances (refrigerators, washing machines, kimchi-refrigerators) and household items (bicycles, motorcycles, gas boilers) contain asbestos material and small-sized electric appliances do not contain asbestos material. All appliances with detected asbestos material showed typical characteristics of chrysotile (7–50%) and tremolite (7–10%). No released fibers of ACM were detected from the tested appliances when the appliances were operating. This study gives the basic information on asbestos risk to people who use home appliances. Implications: All appliances with detected asbestos material showed typical characteristics of chrysotile (7–50%) and tremolite (7–10%). No released fibers of ACM were detected from the tested appliances when the appliances were operating. Asbestos Felt was used in products such as acoustical liners, noise insulation, adhesives, plastics. Note that asbestos may be present in still other substances and even products, not by its deliberate use or design, but because it occurs naturally, such as asbestos that is found in some talc powders (amphibole asbestos). CONTACT US to add items and photographs to this list of asbestos containing materials used in or on appliances. Continue reading at ASBESTOS LIST of PRODUCTS - home, or select a topic from closely-related articles below, or see our complete INDEX to RELATED ARTICLES below. 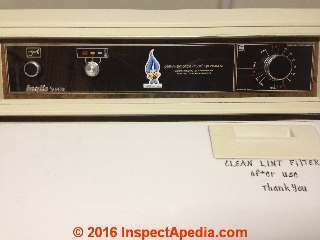 ASBESTOS USE in APPLIANCES at InspectApedia.com - online encyclopedia of building & environmental inspection, testing, diagnosis, repair, & problem prevention advice. Questions & answers or comments about what building products and common in-building products, appliances, mechanical components were produced using asbestos materials.